Northern Arizona University has been named one of just five members of the 2018 class of Excellence in Assessment (EIA) designees, a national program aimed at recognizing universities conducting a comprehensive assessment of student learning outcomes as a means to drive internal improvement and advance student success. The EIA designation, the first national designation of its kind, spotlights institutions that successfully integrate assessment practices across campus, provide evidence of student learning and use assessment results to guide institutional decision-making and improve student performance. Vice Provost Laurie Dickson led the application and qualification process for NAU. 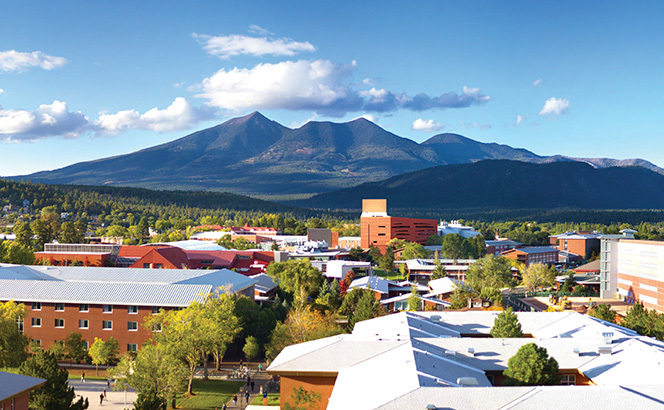 According to the organization, NAU has an intentional, reflective culture of assessment, which allows for clear, student-motivated, quality-driven curriculum, instruction and assessment for all key stakeholders. The university has engaged faculty and staff in integrating multiple data sources and assessment measures in its efforts to use campus-level evidence of student learning. By putting appropriate assessment mechanisms in place, NAU is able to attend to its diverse stakeholders and articulate meaningfulness of its assessment process, thus bringing attention to the “why” of assessment. The sponsors of the EIA program are the Voluntary System of Accountability a public college and university transparency initiative led by the Association of Public and Land-grant Universities (APLU) and the American Association of State Colleges and Universities (AASCU), in partnership with the Association of American Colleges & Universities (AAC&U) and the National Institute for Learning Outcomes Assessment (NILOA). The EIA designations are directly linked to NILOA’s Transparency Framework. The application process for the designation includes a rigorous and systematic self-study. Accredited, degree-granting institutions working to implement and sustain comprehensive use of the assessment of student learning outcomes are eligible to receive the designations.